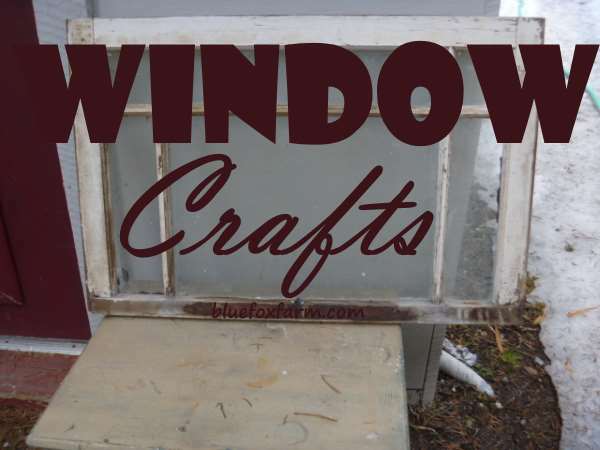 Using old windows to make into crafts is a fascinating way to use obsolete and pretty much useless items. Visit any recycle center any day of the week, and you’re sure to see some of the wooden framed type of window, some with old wavy glass still in them, with lots of small panes. If you’re lucky enough to find some of these with the glass still in them, grab ‘em! There are lots of window crafts that you can make with these, maybe as a cover for a mirror to make a three dimensional frame. They are also unique and unusual coffee tables, with a piece of plate glass over them to protect the old wood. Use windows salvaged from the dump to make window greenhouses or Wardian cases, using similar sized windows attached on all sides and with a hinged door to access the plants you can keep inside. African violets, ferns and many other moisture loving plants will thrive in the humid conditions. As a more involved window craft, this project might require the services of a qualified carpenter as there will be cutting and fitting involved. Still Looking for More Window Craft Ideas? Finding windows with glass still intact is great, but if you come across any window frames without glass, grab those too - you can make a simple box and attach the window to the top of it and plant it with succulents such as Sempervivum and hang it on the wall once they’ve rooted. 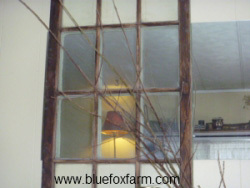 Using an old window to frame a plain mirror gives it a facelift and new life. If you're using this type of garden art in your garden, please be careful where you put it as birds will fly right through it, thinking the reflection is more garden. This is a good use for those windows that simply don’t have much strength. Either use one with glass still in it, or without. Use caution when working with really old windows as the glass itself could be brittle with age, or the putty holding it in the frame deteriorates and the glass could fall out. Think outside the box - glue on some colored glass blobs to make a 'stained glass window' or use a similar method by painting shards of glass and applying them to the window with E6000 glue or some similar type of adhesive - make sure it dries clear so the color shows through. Keep in mind that both of these crafts will add weight to the existing window, so make sure you use one that is strong enough. Use gloves when working with broken glass; safety first, as always. See the vintage windows page for more ideas for your old wood framed windows. Have you made anything cool with old windows? Share your ideas! Do you have a great rustic art project? Please share! If you're into creating fun accessories for your garden, porch or home, I want to know all about it! Please share your pictures or graphics. Click the button and find the first one on your computer. Select it and click on the button to choose it.